Queen Street prison, 1850s. Collection of Christopher Dawson. One of the major shifts in nineteenth century penological thinking was in the area of prisoner classification, a shift that was neatly reflected in the changing design of Queensland prisons constructed throughout that century. The stone walls that separated a prison from the world outside were increasingly used to the divide and control the people and space inside. 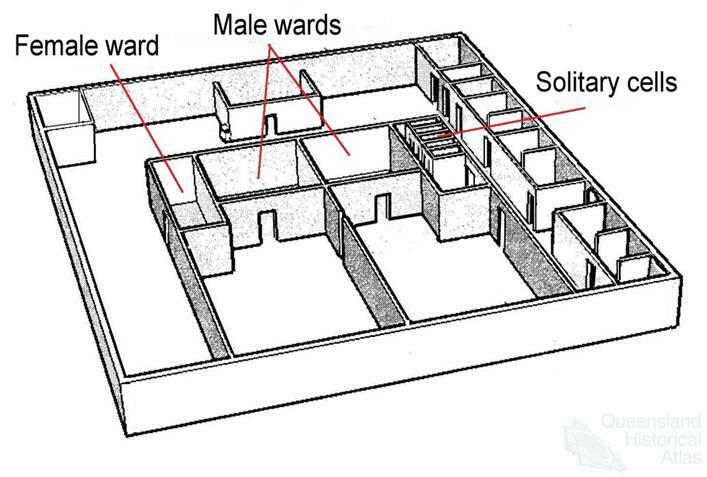 Early colonial prisons were designed according to what became known as the associated system, in which prisoners were kept in large communal wards, the only separation being made between the sexes. This system was considered outdated by the 1840s, as the emphasis of imprisonment shifted from retribution and deterrence towards ‘reforming’ prisoners during the term of their sentence. Despite this, the Queen Street prison was made up of common wards. A petition put forward by Brisbane citizens in 1857 complained that these wards saw ‘crimes of the most revolting, disgusting, and unnatural description’. Similarly, an 1887 inquiry reported the Toowoomba gaol was ‘little better than a manufactory of abandoned and criminal women’. The separate system gained popularity in the mid-nineteenth century, based on the idea that prison discipline and inmate reformation was best facilitated by keeping different types of prisoners, such as those on remand or serving short-term or life-sentences, apart so as to overcome any ‘corrupting influence’. The prison that opened on Petrie Terrace in 1860 was the first in Queensland to be made up of separate cells, which were originally intended to hold one prisoner each, but often held more due to overcrowding.